For me, one of the nicest things about thrifting is the "we used to have one of those" moments, where I spot something I remember from my childhood. That's one of the times that I break my own de-cluttering rule, and buy whatever it is, whether I need it or not. More often than not, it's something I've not even thought about for years, but just seeing it will bring memories flooding back. That's the case with the tiny mouse I found today sitting on top of a "10p box". I bought an almost identical mouse to this one in a little craft shop on a childhood holiday to Cornwall. I must have been about 7 years old, and can remember marvelling at the tiny stitches and the detail, loving the ribbon skirt, beady eyes and the leather tail. 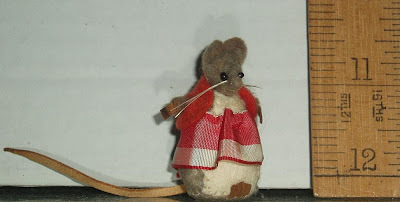 As a kid I spent hours drawing intricate little mouse houses, and then making furniture and rooms out of old matchboxes and other bits and bobs, crocheting little blankets and cushions. When I was almost an adult and the Brambly Hedge books came out I realised that I was not the only one. I wonder if the author was inspired by one of these tiny felt mice. By the way, I realise that the photo looks disturbingly similar to a police mugshot. Can I just make it clear that the mouse has committed no crime, and the ruler is there just to show scale. Sweet! Like the ruler too! I don't know - that mouse looks guilty! Cute but guilty.